This tasty warming dinner can be on the takes little time to prepare but your family and guests will think you’ve been in the kitchen for hours. 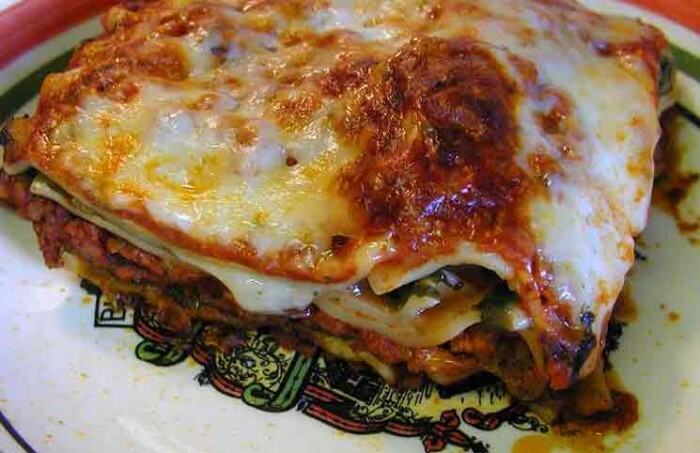 The very first lasagne was thought to have been made the city of Naples in Italy. Traditionally, lasagne is made of layers of ragu (a slow cooked meat sauce) béchamel (a white sauce) and parmigiano cheese. In different regions different ingredients are used to created delicious variations. Today we’re going to make a short-cut lasagne that’s both economical in time and money. Easy to prepare and put in the oven to bake, it’s wonderful served with a crispy green salad and some crusty bread. Preheat oven to 350° F. After spinach has thawed squeeze to extract excess liquid and then set spinach aside. Take a large shallow pan and fry the sausage with a little oil. When cooked set aside. Take an oven-proof baking dish the same size as your lasagne noodle sheets. Spoon enough spaghetti sauce to cover the bottom of the dish then add a layer of lasagne noodles. Top with half the sausage, then half the spinach then half the grated mozzarella. Add another layer of noodles then add sauce, sausage, spinach, cheese. Sprinkle the top with parmesan cheese and cover with foil. Place in the oven to bake for 50 minutes then remove the foil and allow the cheese to brown (approximately 10 mintues). Remove from oven and allow to cool for ten minutes before slicing and serving.